I have to admit, the past few weeks I may have enjoyed playing with yarn and my camera a wee bit more than I've enjoyed playing with yarn and my needles. 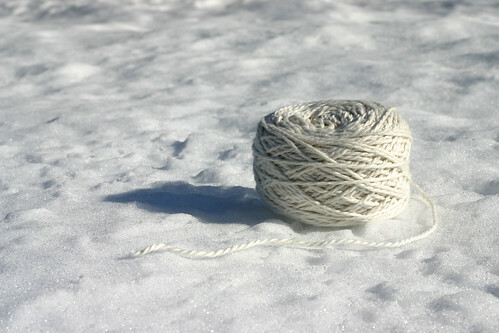 There was just something about the simple beauty of the soft white yarn on the soft white snow. I'm usually one to favor bright and intense colors, lots of them, especially if stripes are involved, but the clean and crisp, it captivated me. Whatever it is, I hope it makes you smile inside and out! I do, I do, though the past several weeks I haven't knit as much as my usual. I've been reading a lot (ironically enough, I've been reading about writing), and a lot of reading takes up a lot of time. 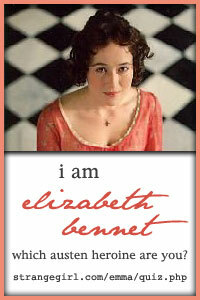 My reading and my knitting usually come in spurts of obsessive one-or-the-other-ness. All knitting, all the time, or all reading, all the time. A few days of one and then a few days of the other. Reading has always been an easy thing for me to hop back into, but knitting is not always like that. Knitting momentum, for me, is a mysterious thing at times. I can knit obsessively, picking up steam on a project, get distracted (sometimes with another project, often times with one of my sweetly distracting children), and then, for some inexplicable reason, not want to pick that project back up. I'll put it off for hours, days, sometimes a week or more, sometimes so much more... Crazy odd, I know, especially for a yarn enthusiast and knitting designer. The rest of the truth is that I've been putting more of my brainpower into my Mothering, and that's a good thing. I've been blogging thoughts and Mothering process shots over at anordinarymom.com. I never meant to neglect this place, but it's that momentum thing. It's like my momentum pendulum has swung another direction for a while. I have so many ideas and projects going that I'm sure my knitting and designing will gain momentum as we swing into a new season- one that includes sunshine and warmth. Which reminds me, I need to go take my vitamin D.
We have the rest of February and the entire month of March yet to experience in The Frozen Tundra*, so my lingering scarf should still get some wear yet this season. Those of you who have already packed your scarves away, or gasp!, never donned a scarf this past season (because you would've been way too hot in your garden...), well, I guess I shouldn't complain about your flower pics, after all, I can't imagine the angst of a knitting or crocheting yarn enthusiast who misses out on a good cold winter in which to wear so many hand knit hats, mittens, scarves, & sweaters. Oh, and socks, I imagine my Florida friends might sweat a little in hand-knit wool socks... I'm not a fan of sweating. I am a fan of sweaters and even sweater socks, but not sweating, so the Frozen Tundra living does work out for me. I've mentioned the scarf, the scarf that defies explanation (more on that soon), and I am also working on a sweet little spring cardigan for my youngest daughter- still needs buttons. I had grand intentions of knitting all 4 of them matching cardigans, but that just isn't going to happen this season. That's ok, I've got family that continues to hit the Old Navy clearance racks and they always have something that one of my children really should have that week :-) It's like having a small army of personal shoppers, which is cool because I dislike shopping, except for the occasional trips to the Hanna Andersson Outlet for some unbelievable $5 finds. Yes, most of the Hanna's you've seen on my girls in photos over the years were $5 dresses. I love their outlet sales. Enough said. Some teasing, a spring sweater for my youngest daughter. ...and pick up the sleeves for a few finishing rows. Oh, and buttons, can't forget buttons. With any luck (and a whole lot of effort on my part, haha! It's not like I'm drowning in spare time around here...) I may finish it tonight, and perhaps even get a few modeled shots tomorrow while we're out and about. That would be good, nay, better than good, that would be grrreat! So, you see, I have still been knitting. my sister and her new baby boy! Ah, life is busy and life is full, and a girl's gotta put down the needles now and then and get to living it, in all of its busy-ness and fullness! With that being said, it's time for me to get back to it!